Imagine a printer that's small, sleek and silent. The SAMSUNG SCX-4500W wireless laser MFP is half the size of its nearest competitor, it's the smallest laser MFP in the world. Its piano black finish, buttonless controls and blue LEDs make it the sleekest MFP to ever grace a desk. At just 45 dBA, it's the quietest laser MFP in existence. 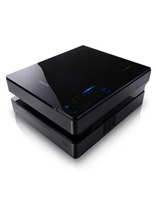 And the network-ready SCX-4500W has fast Ethernet and wireless 802.11 b/g built in, so it's ready to work anywhere in your home or office. With the SCX-4500W wireless laser MFP, it's not hard to imagine. One look at the exquisite design and the high gloss finish and you know that this is unlike any printer you've ever encountered before and you've only just seen the surface. The design is pure luxury, elegantly crafted in a sleek, compact body embedded with Sapphire LED's. The SCX-4500 is made to serve people, not annoy them. Be amazed by the low noise this printer produces. Normally, conversation between two people is about 50dB of sound but with this SCX-4500, it is just 45dB. This printer will no longer intrude you with a noisy working environment. No more space consuming printer. This downsized printer does not compensate the capacity nor its design. It's more portable and no more worries of bulky and bulging desktops but a slimmer and more beautiful desktop that makes your desk a pleasant and spacious area even more. In the past, people had to take a deep breath and give a hard yank to pull open their paper trays. Welcome to the next generation the semi-auto sliding cassette tray. Fully upgraded, the ample 100-sheet tray slides out with a simple push of the eject button. Once the stock is replenished push the tray and feel the docking mechanism lock into place. By just slightly tapping on the button, it will operate your printer with the functionality that will auto run your printer without extra force in application.